For those looking for something extra, hotels or guesthouses in historical buildings are often called Pousadas. Another option if you are staying several days at the same place is to rent an apartment, especially in the Algarve region where you can find a large choice. You can go through rental agencies, Booking.com or Airbnb. 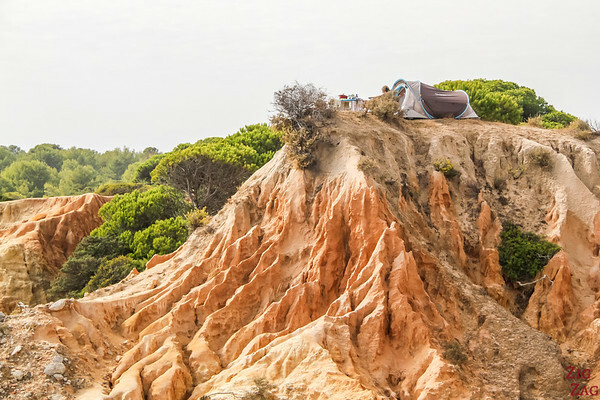 Portugal has a good network of Campsites (called Parques de Campismo). Free Camping / Wild Camping is tolerated in the country site. It is not accepted in nature parks and beaches unles otherwise indicated. The wildfire risk is high in Portugal in Summer. Always better to ask the local tourism office if you are allowed to camp. I selected and paid for all my accommodations. Opinions are my own. My reviews are based on my stay in October 2016. I personally always use Booking.com and Airbnb this is why I do my recommendations via those websites. Most links in this article are affiliates. It means that if you book a stay at one of those places (or another) via my link, you pay the same price but I get a small commission. It helps me keep this website running to help you plan memorable trips. Capital of Portugal, Lisbon is a very enjoyable city to stay for a couple of days at the beginning or the end of your road trip. To get easy access to all main historic sights, the neighbourhood of Baixa and Chiado are the most practical. And if you want to experience the older quarters, you can stay in the nearby Alfama. By the time I booked my accommodation in Lisbon, I had difficulty finding a hotel in the area I wanted. So I booked an Airbnb: The Real Old Quarter House. ​Location: Really good location not far from the waterfront. Busy neigbourhood. State: Quite modern inside. All equipement needed included. Check-in: Very nice host - a small hicup to check-in so we had to wait. But errors happen. Like in many old buildings in Lisbon, there are steep stairs to reach the flat. Porto in the city of the North in Portugal. It has a lot of charm and I recommend spending at least 2 days to enjoy it! ​Location: Fantastic location near the restaurant, the river and everything! State: Clean. Shower looked great but water pressure was not the best. Check-in: Meet up in a shop nearby, really nice welcome, with a few gifts in the apartment. Loved it! You will have to pay for parking in the large underground one nearby. The rental agency provides reduction cards. Sintra is main the Touristic town outside of Porto and Lisbon. It is full of amazing palaces which have been listed in the Unesco World Heritage list. Definitively a must stop! 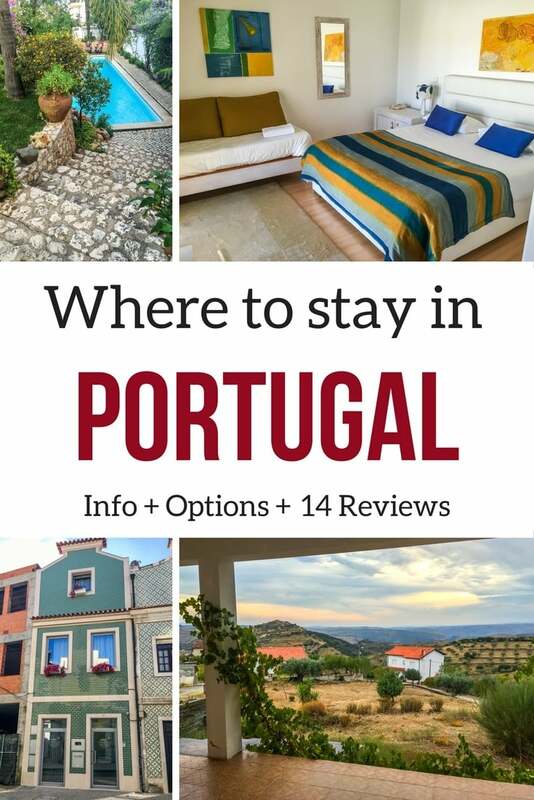 Where to stay in Sintra? You can either stay in the older part of town at the bottom of the hill around the National Palace or fin cheaper accommodations in the modern part of town just a 15min walk away. I opted for the modern part and selected the CasAzul Apartments because of the ideal location and amazing reviews on Booking.com. If you are very very tall, I would pick another one has it is under the roof. I managed at 1m75. Like from most apartments in Sintra, you can hear the train passing by. Check-in: very easy. Maria was very welcoming. Obidos is one of the most famous fortified villages in Portugal. Not far from Lisbon, you can spend the night here and tour the whole wall at sunset or sunrise! There are accommodations inside the fortified city or just outside the wall. I selected Casa do Fontanerio de Obidos for the excellent reviews and location just near an entrance in the wall. ​Location: Just outside the fortified wall. Easy central access to the "village" of Obidos. State: Quite old house. The family loves explaining the history. Clean but tired. A lot of charm. Breakfast: Nice - great atmosphere. Good choice. Portugal has some really magnificent monasteries. Batalha is one of the most famous with its unfinished chapels. If you are spending the night there, you can visit it early before the crowds! I chose Hotel Casa Do Outeiro for its location close to the Monastery and its excellent reviews. I had booked a normal room. But some rooms have balconies with views over the monastery. The staff was kind enough to let me see the view from one of those rooms as you can see in the pictures below. Review: One of my favorites! State: Modern, clean, a lot of light! And a pool (not heated...). Very enjoyable building and rooms - only the bathroom was boring compared to the rest. LOCATION, location, location: Hotel Mestre Afon﻿s﻿o Domingues is facing the monastery with great views from the restaurant area. Check prices and availability. Luso is not a very touristic places but Portuguese people enjoy going there in Summer for some greenery and fresh air. The thermal town is at the foot of the Bucaço National park and its palace and convent. Aveiro is considered the "Venise" of Portugal with the waterways in the city. You can decide to stay in the town or on the beach 10min drive from the town is some of those colorful houses. I opted for the town center and selected a stay at Casa do Cais. ​Location: Really good location near the water. Quiet. State: Very modern and clean. Common area on the ground floor and common patio. Check-in: No issues. Welcoming owners with good advice. Starting in Porto the Douro Valley extend all the way to the East border. This is a very touristic region and there are many places to stay along the winding river. Because of our itinerary, driving down from Guimaraes, I selected a stay at the Quinta Das Quintas and Spa in the town of Baiao for its location and good price. State: The main building is old. However our cottage a bit futher on the road was all modern and large with 2 bathrooms and a huge terrasse. After driving all along the Douro Valley, I wanted to stay in a cheap place with nice views. I opted for an Airbnb in Castelo Melhor called Douro Internacional Castelo Melhor. It is to the East before reaching The Parque Natural do Douro Internacional. The rooms were spacious and the views from the living room were great! You live with the host but this is a great way to learn more about the Portuguese culture. Maria is adorable and can offer a home cooked meal in the evening for a very small fee. It was absolutely delicious!!!! My parents and I really spent a wonderful evening and night there! Serra de Estrela is the highest mountain range in Portugal. Its main town is Manteigas with beautiful white houses in a valley. As I wanted us to cover most of the range before the nights, I selected an accommodation a bit more to the South in the town of Loriga where the River beaches are. I had a hard time choosing as the reviews were really varied. I opted for Casa do Meio da Vila. Check-in: I phoned before arriving and met with one member of the family. No issues. Marvao is a beautiful village in near the Border with Spain. At the top of the hill, the white house village and castle offer splendid views of the region. I love amazing views. So I wanted to stay at the top of the village and selected Dom Dinis. State: Clean, Practical. Good bathrooms. Evora is a famous walled city with Greek and Roman architecture. It is a great 2 day excursion for people staying in Lisbon. I wanted to stay in the heart of Evora to easily visit everything on foot. I selected the Evora Inn Chiado Design. ​Location: Perfect! Near the main square and close to everything. Lots of stairs to reach the rooms! Check-in: Very welcoming team. No issues. Very helpful. If you want to explore East Algarve, Tavira is the place to stay. This small town has a lot of charm. Once again I wanted to be in the center for easy access to everything and I was looking for a reasonably price options, to be able to spend a bit more on the next one. I opted for Taah Billa Guesthouse. ​Location: Perfect! near the water and not far from the "castle"
State: Simple but very practical, clean and spacious. I love the minimalist feel. The Algarve region is very touristic and there are thousands of options for accommodation. While looking I opted for Lagos to be close to some of the most beautiful beaches in the region. When I saw the pictures of Uma Casa A Beira Sol, it was love at first sight. Which ones inspire you to book a stay?